Denes Hot Itch Lotion is a soothing and cooling application containing essential oils known to promote skin health and reduce inflamation and the associated irritation caused by eczema, dermatitis, burns, hot spots and other skin conditions. 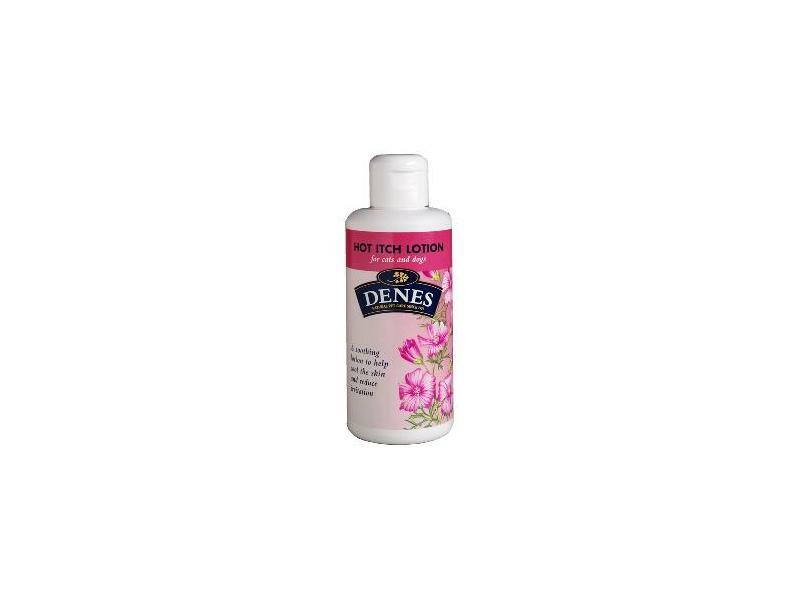 Boasting the potent properties of Tea Tree, Blackberry, Blood Rood, Musk, Mallow, Carrot and Juniper Oil, Denes Hot Itch Lotion is a powerful and gentle lotion ideal for providing lasting comfort and relief for sore and itchy skin. Below are some recent questions we've received regarding Denes Care Hot Itch Lotion, including answers from our team. Would this help a dog with a bald neck? My basset hound has a bald neck which at times is red and looks slightly sore. I had a vet look at it and they said it was due to sweat which is caused by his thick jowls, nothing seems to be helping it and I'm starting to think it's a hot spot. Would this help his poor neck? It is difficult to know from your description what the cause will be. This lotion could well help. If there are skin folds which are moist and if they smell, then a more potent antiseptic wash might be better, such as Hibiscrub. I would check this with your vet. The Denes Lotion will do no harm though. would the above product help to relieve a cat suffering from flea allergies diagnosed with dermatitis from irritation and scratching itself. already has advocate every 4 weeks? This should be safe to use on a cat, but applying anything to the skin on a cat can encourage the cat to want to lick it off. Any repeated licking will cause further trouble if it continues, because of the roughness of a cat's tongue. It depends on your cat - if you cat does not respond by just wanting to lick it all off, then it should help. It remains vital to do everything you can for flea control (spray the house with something like Indorex for example). It can also help to provide one of the oil supplements by mouth, as this can improve skin condition and reduce the sensation of itchiness. Yumega is a good example.